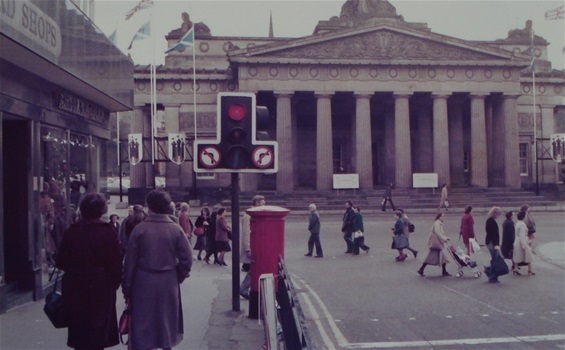 When, in 1979, I drove down Hanover Street in Edinburgh with the intention of turning left on Princes Street, I got a surprise. According to the traffic signs I could turn neither left nor right! 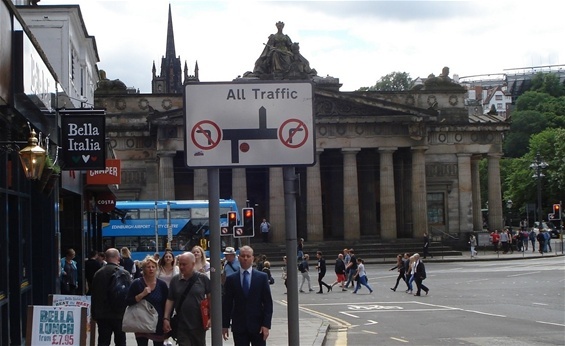 My only option, according to the traffic signs, was to drive straight - straight into the Royal Scottish Academy? Unfortunately my car was the only one waiting for the red light to turn green, so I had nobody’s example to follow. Luckily, however, there was virtually no other traffic so I decided to turn left anyway, in the planned direction. The following day I came back to the same place, on foot, to see how the local drivers handled the situation. I soon learned that ‘straight’ meant turning right, driving less than 50 metres, and then turning left, onto the Mound. In July 2015 I visited Edinburgh again. I decided to go to the crossing to see if anything had changed. And yes, had the new sign been there 36 years ago, I would have had no problem knowing which route to take.